The Evening League – the evolution of the Self-Paired Tournament – has gotten a major tech upgrade in its second year thanks to TD Andrew Hall. Hall developed a web app for tracking played games and statistics that anyone can access for tournament updates. “I’ve been running a continuous version of the tournament in the Boston community since last year,” Hall says, allowing him to refine the tournament structure and improve results tracking. Visit evening-league.massgo.org to see the results of the first night of play, and throughout the week to check on player results and statistics. This year there are only four nights of scheduled play, but like last year players may play self-paired games and submit them to the tournament throughout the week. A smaller than usual but still jovial crowd gathered for the 13×13 tournament Sunday evening. TD Jim Hlavka reported a few over 40 players, and expects that the lower numbers this year are a result of the lack of 13×13 tournament at last year’s Go Congress. 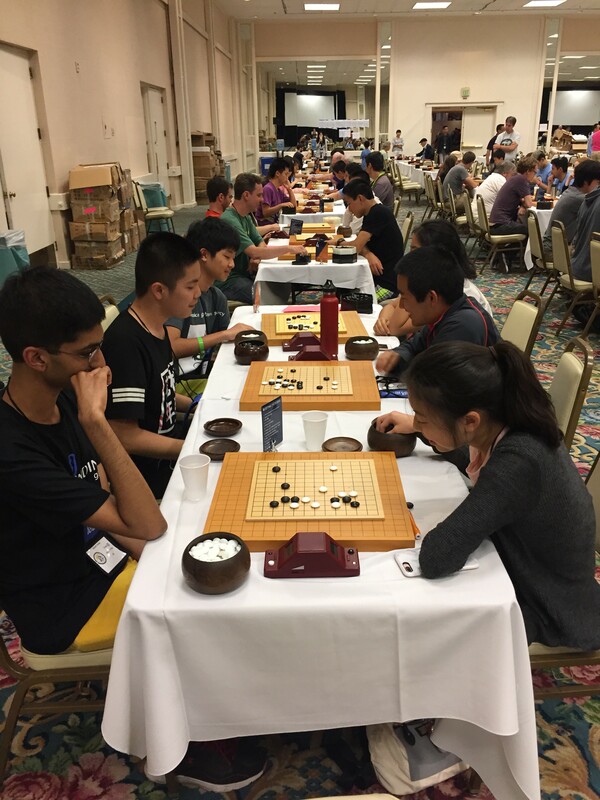 Table winners: Brandon Zhou 6D, Yin Zhang 2D, Eugene Zhang 1D, Jim Conyngham 4k, Darwin Kim 4k, Maria Espinosa 9k, Josh Johnson 16k. TD Lisa Scott also reported a lower turnout than previous years. However, she concedes that part of this is due to some women choosing to play in the Seniors’ Tournament, which takes place on an overlapping schedule. Regardless, Scott is pleased with the strong field of players, a good number of whom are 4 dan and stronger. photo (right): Evening League TD Andrew Hall punches the clock. 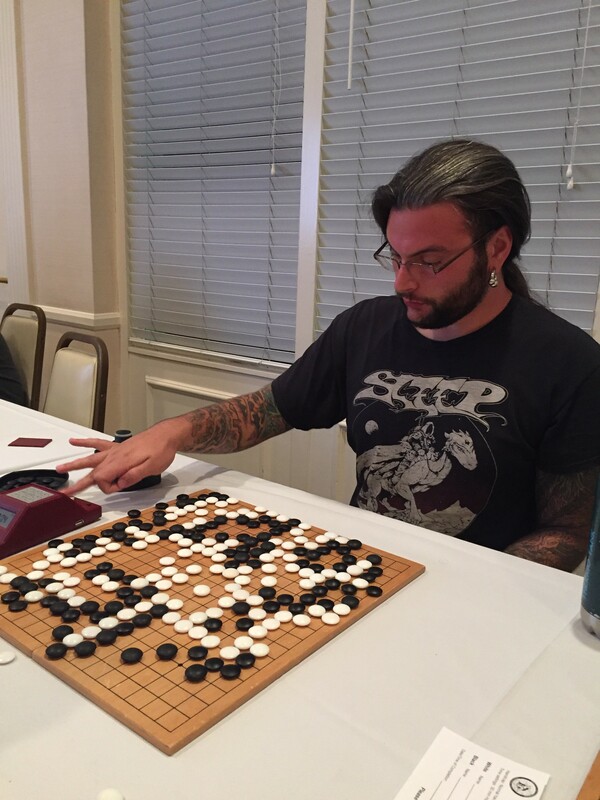 photo(left): Players smile over their tiny boards in the 13×13 tournament.